Newton entered his uncle's old College, Trinity College Cambridge, on 5 June 1661. He was older than most of his fellow students but, despite the fact that his mother was financially well off, he entered as a sizar. A sizar at Cambridge was a student who received an allowance toward college expenses in exchange for acting as a servant to other students. There is certainly some ambiguity in his position as a sizar, for he seems to have associated with "better class" students rather than other sizars. Westfall (see  or ) has suggested that Newton may have had Humphrey Babington, a distant relative who was a Fellow of Trinity, as his patron. This reasonable explanation would fit well with what is known and mean that his mother did not subject him unnecessarily to hardship as some of his biographers claim. Newton's aim at Cambridge was a law degree. Instruction at Cambridge was dominated by the philosophy of Aristotle but some freedom of study was allowed in the third year of the course. Newton studied the philosophy of Descartes, Gassendi, Hobbes, and in particular Boyle. The mechanics of the Copernican astronomy of Galileo attracted him and he also studied Kepler's Optics. He recorded his thoughts in a book which he entitled Quaestiones Quaedam Philosophicae (Certain Philosophical Questions). 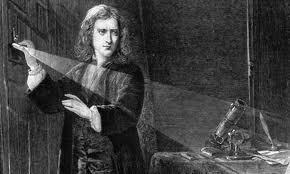 It is a fascinating account of how Newton's ideas were already forming around 1664. He headed the text with a Latin statement meaning "Plato is my friend, Aristotle is my friend, but my best friend is truth" showing himself a free thinker from an early stage. ... asked Newton what orbit a body followed under an inverse square force, and Newton replied immediately that it would be an ellipse. However in 'De Motu..' he only gave a proof of the converse theorem that if the orbit is an ellipse the force is inverse square. The proof that inverse square forces imply conic section orbits is sketched in Cor. 1 to Prop. 13 in Book 1 of the second and third editions of the 'Principia', but not in the first edition. In 1703 he was elected president of the Royal Society and was re-elected each year until his death. He was knighted in 1705 by Queen Anne, the first scientist to be so honoured for his work. However the last portion of his life was not an easy one, dominated in many ways with the controversy with Leibniz over which of them had invented the calculus.